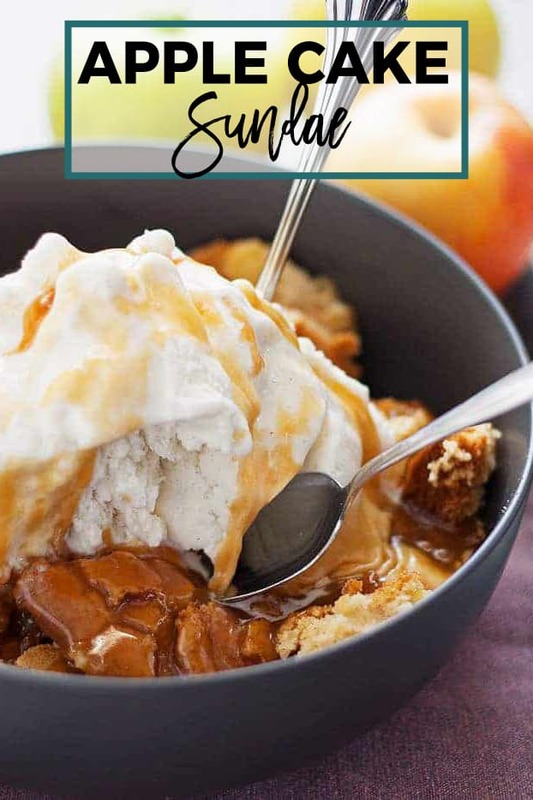 This apple cake sundae is a fun and easy fall dessert. Hot apple cake is topped with creamy vanilla ice cream and drizzles of caramel! When the weather gets cooler, I start to dream about desserts that are decadent, delicious and dying to be eaten. Pies, of course, are super popular during the season change. Also, apple season + pies = heaven. But this isn’t a post about apple pies. Its about this delicious crumbly apple cake sundae. I decided on a recipe and over Labor Day weekend started testing it… and had a little accident with some caramel. After a trip to the ER, I took a few days to regroup and go back to the drawing board. The drawing board kept bringing me back to my original idea so I decided to run out to the store and buy caramel syrup instead of making it from scratch… Couldn’t find any. An apple cake sundae just cannot be without caramel so I sucked it up, and carefully made this caramel from scratch. My little apple cake sundae is a haphazard mix of apple cake, vanilla ice cream and caramel drizzle; its also the opposite of little. I like it because its not perfect – it’s just super delicious. The apple cake portion is very easy to make – you don’t even need a stand mixer. I usually just use a little bowl and a mixing bowl; because the butter is already melted its super easy to combine the sugars and liquid. I made the caramel before I started the cake so it had a chance to cool. If you are also making it from scratch, I recommend you do the same because caramel is hot. If you are using store bought caramel, keep it at room temperature. When the cake is done baking, take it out of the oven and let it cool for 10 minutes. Then grab a big bowl and a big spoon cause it’s time to dig in. We made one massive sundae because… Sunday. And pictures. You will probably want a smaller portion. If you have leftovers, put them in the freezer. We did and are slowly making our way through our massive (now frozen) apple cake sundae. Preheat oven to 375 degrees and grease a 8x11 inch baking dish. In a small bowl, combine the flour, baking powder, cinnamon, nutmeg and cardamom. Set aside. In a mixing bowl, use a wooden spoon to mix the brown sugar, white sugar and melted butter together. Add the beaten egg and vanilla extract and mix until sugar mixture is wet. Slowly add the set aside dry ingredients and mix until just wet. Fold in the apples. Pour the apple mixture into the set aside baking dish and put it in the oven for 20-25 minutes. Remove from the oven when the top is brown. Let cool for 10 minutes. 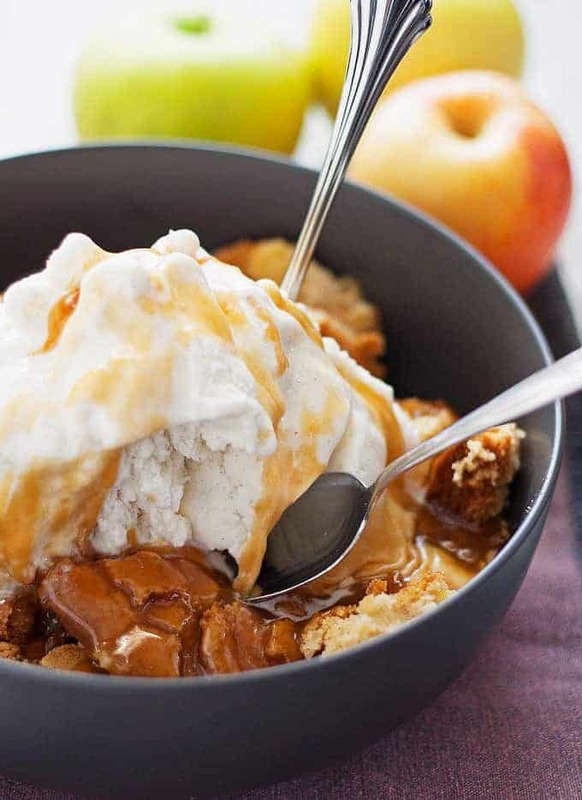 To prepare an apple cake sundae, place 2 spoonfuls of apple cake in a bowl. Top with a scoop of vanilla ice cream and drizzle caramel on top. I used this caramel recipe but left out the salt. apple almond cranberry quick bread! Anything apple, ice cream and caramel, I’m all over it! My gawd that looks crazy delicious! 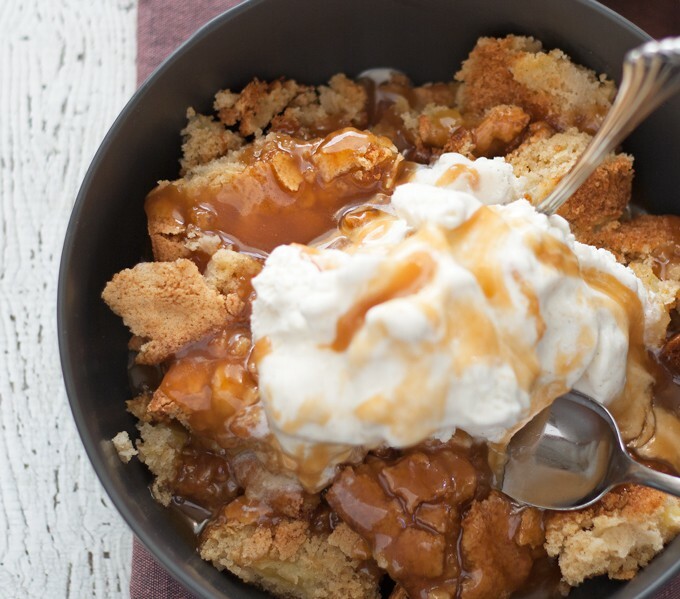 You’re apple cake topped with vanilla ice cream and caramel sounds absolutely delightful. Wishing I had a bowl right now! That mix and match box is so cool! I stink at making caramel. I really do. There’s only one recipe I can make without ruining. Awesome that you kept trying. And this looks amazingly delicious! Thanks Erin! I knew I could make it right eventually! 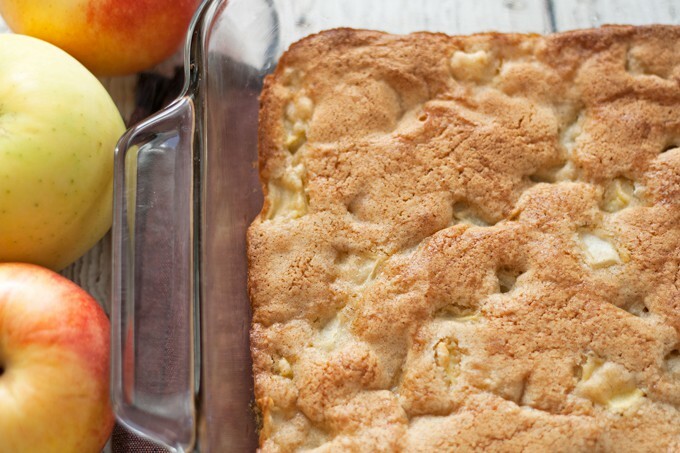 Apple cake is one of my favorite fall desserts, especially with ice cream! Those apples look delicious. Love that there are so many varieties to choose from. Thanks Heather! You can never have too many apples! Fantastic looking dessert and perfect for fall! Amazing recipe that is positively perfect for apple season! That sauce really does send it over the top! Wow! Apple desserts are my favorite during fall! I can’t say I’ve met one I haven’t liked. 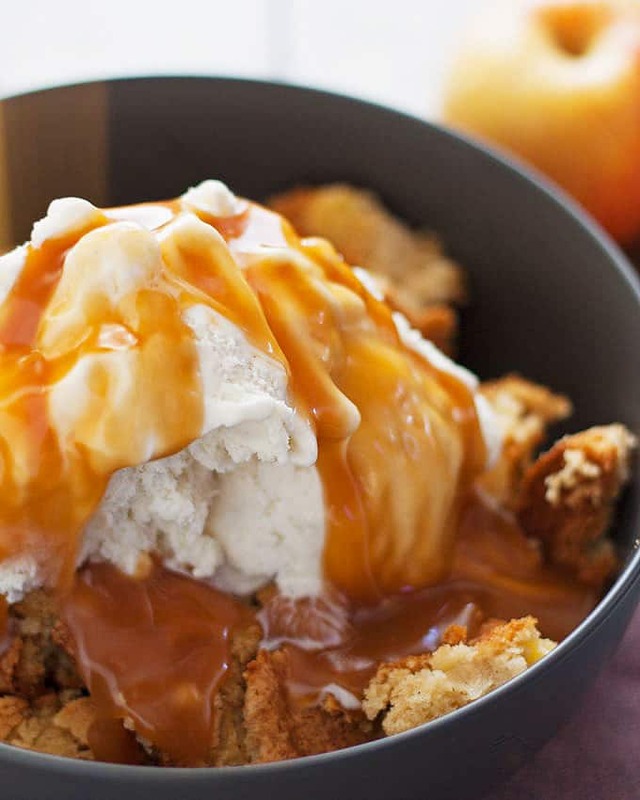 This apple cake sundae will definitely be making an appearance in our house this fall! I hope you like it Danae!! Oh wow, what a gorgeous apple dessert! Your photos are absolutely beautiful! You had me at sundae and then you went and drizzled that delicious-ness over it. Hello! I need this in my life! I agree, everyone needs this! Thanks Maria! You have totally outdone yourself with this one, it looks amazingly decadent! Jenny, that looks like an awesome autumn dessert! Aren’t apples the best?! Thank you Jean!!! I just love apples! Thank you Carrie! Apple season is my fave! Oh my gosh! I drooled! This sounds so amazing! YUM! Pinned! What a great looking recipe! Pinned! Thanks for linking up to Merry Monday! Sharing on my Fb Page tomorrow! Have a great week! This cake looks like the epitome of fall! And I live how you turned it uni a sundae. Looks so delish! Oh WOW! This looks fabulous! I need to make it ASAP! The cake just came out of the oven and I had to sneak a piece – delicious!! I can’t wait to serve it to my guests tomorrow, they won’t know what hit them 🙂 I doubled the recipe and filled 3 loaf tins instead of an 8×11 dish. I think I made them a bit too thick as they were a bit mushy-looking in the middle, so I left them in for a bit extra. Still tasted amazing! Best part is, I can now serve one tomorrow night and have two left in the freezer for quick desserts! Yay! I am so glad to hear you like it! Wow that looks amazing, I love the combination of a hot dessert with cold ice cream! I may have just drooled on my keyboard a little! Oh my yum! Thanks for linking up with our Merry Monday party – I’m pinning this and planning to make it this fall! 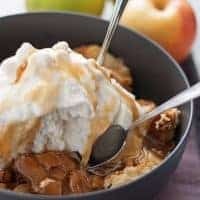 I just pinned your delicious Apple Cake Sundae, we will love it! Thanks so much for sharing with us at Full Plate Thursday,we are so happy to have you join us. Have a wonderful week and come back to see us real soon! What an amazing looking decadent dessert! Thanks for sharing at the What’s for Dinner party! Looks FANTASTIC! I can’t wait to try it. However, I didn’t see your caramel topping recipe. Did I miss it? Hi Pamela! Thanks for emailing – I didn’t realize the caramel recipe link disappeared. Here it is – https://sallysbakingaddiction.com/homemade-salted-caramel-recipe/ I used that recipe but removed the salt.